Two short plays comprise Acts of Disunion, neither of which assert anything positive about the future. In the first, Button, Julia (Zari Lewis) has the final say over whether a large red button should be pressed. The population, or what remains of it, live in underground bunkers because some disaster or other has occurred which makes ‘the surface’ uninhabitable. There was, at some point previously, a vote in which the people decided in favour of pushing the button. But what does the red button do? This isn’t explicitly explained during the show (perhaps because nobody really knows) but Julia is in possession of what she asserts are a number of research reports all claiming that pushing the button is a Very Bad Thing. Stanley (Howard Lewis Morgan) is keen to see to it the will of the people should prevail – the people want the button pressed, so it should be pressed. In the end, Julia gives the go-ahead, though in a plot twist, Stanley doesn’t exactly rush over to push the button. (If anything, at the risk of being unkind, it would make for an even shorter play than it already is.) The aftermath, when the deed is finally done, is brief and involves further twists in the story. Both actors very much made the script come to life, and a narrative that might well have become bogged down in pedantry over a sodding button was instead darkly entertaining. Kingdom sees Alton (Richard Harfst) refusing to budge from his home of half a century. There has been talk of new housing projects and now his son Mark (Paul Boichat) pops round and gently mentions the possibility of selling up. The older man, perhaps predictably, refuses. There’s a palpable dislike of the local council (who are trying to turf him out of house and home) on Alton’s part, and a dry sense of humour permeates the dialogue. There may well be, for instance, construction works going on all around – the noise of drilling can be heard throughout much of the play – which Mark finds off-putting. Alton thinks nothing of it: he’s been through harder times and starts to talk about the Second World War, much to Mark’s chagrin, as he’s heard these anecdotes many, many times before. The conversation meanders around various themes and topics. It is, however, always brought back ‘moving out’ because the police are knocking on doors telling people to evacuate as the construction workers have unveiled an unexploded WW2 bomb. Alton still isn’t going anywhere – for one thing, his wife Angie (an off-stage character) is not in the best of health. The neighbourhood that Alton once knew has (of course) changed dramatically, and he struggles with market stall traders who do not speak English as their native language. Mark admits to having to try hard not to unleash fury on his father – for various reasons – and Alton’s insistence on physically staying put becomes a metaphor for being a mindset stuck in a previous generation, continuing to live in a world that – little by little – has gradually ceased to exist. In both plays, there is a sense of both individual and collective loss. The plays are presented as being about ‘Brexit Britain’ but there is still much to ponder on for those (like yours truly) who have had quite enough of that particular ongoing saga. There’s no mention of parliamentary debates and all that jazz – just a couple of penetrating two-handers that are as thoughtful as they are curious. Two short plays about Brexit Britain – the absurdity, the tragedy, and the need for resolution. 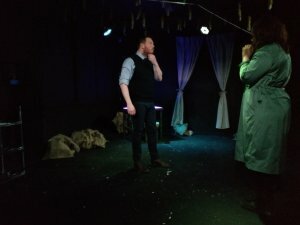 (Antigone, Fear and Misery of the Third Reich), in association with White Bear Theatre, present two different yet unique visions of Brexit Britain. In a dystopian future, a catastrophic event has forced Earth and its inhabitants into underground bunkers. One bunker is fitted with a self-destruct button, which everyone is warned against pressing. What happens when people vote for the unthinkable? After years of darkness, will they live to see the light, or bring about their own annihilation? In an uncertain present, one elderly man and his sick wife are being forced out of their home by a new development. A well-meaning son tries to make his father see sense and leave the past behind. When an unexploded bomb is discovered beneath the property, both men will confront their differences and what it means to be British in an era of globalisation and gentrification.